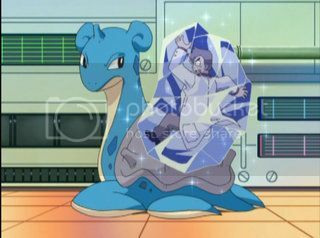 To round off my top 3: The episode with the Crystal Onix. Fwee, it's Garnetpaw, my ThunderClan counterpart! I liked "The Ghost of Maiden's Peak", the one with the ghost of the girl who lost her love and her Gastly goes out and scares people and stuff? That episode made me cry. if you're ever wondering if im some other guy, the answer is yes, im him, unless it's bad to be him, then im not him, im a different person. Thanks Floonkin for my avvy. Don't give credit to quitters. They don't deserve it if they quit during a job. It is not PUK. It's PKMN.NET. Get it right. My favourite Ep has to be the first one. I love it because of the R/B sequence at the start. Cause Rule #20 has left this town. Rule #20 must be found." Mine has to be without a doubt, Eletric Shock Showdown. It was the first episode where Ash really earned a badge properly as he didnt reallt beat Misty or Brock properly. And the gym battle wasent interupted by team rocket ( I hate it when they do that). It was the first dub episode I saw back in 98 after I had already seen some of the early japanese episodes when I was over there and that episode made me love pokemon forever! My favourite episode is 'A Mudkip Mission' It was funny 'cause of all the Mudkips !!. I kinda like "Ghost of Maides Peak" "Battling Eevee Brothers" and "Espeon not included". there are so many episodes. CC's making a comeback people! Mine's the first episode where you meet Cyndaquil! It was like the Charmander one, it's just there on a rock, and to trainers are arguing and battling over it, I didn't blame them really! Cyndaquil's been my fave since that epi! Thanks TMDR for being such an awesome friend! And don't forget she did the avatar picture! What's that one again, I think I've seen it. Page created in 0.273 seconds with 23 queries.